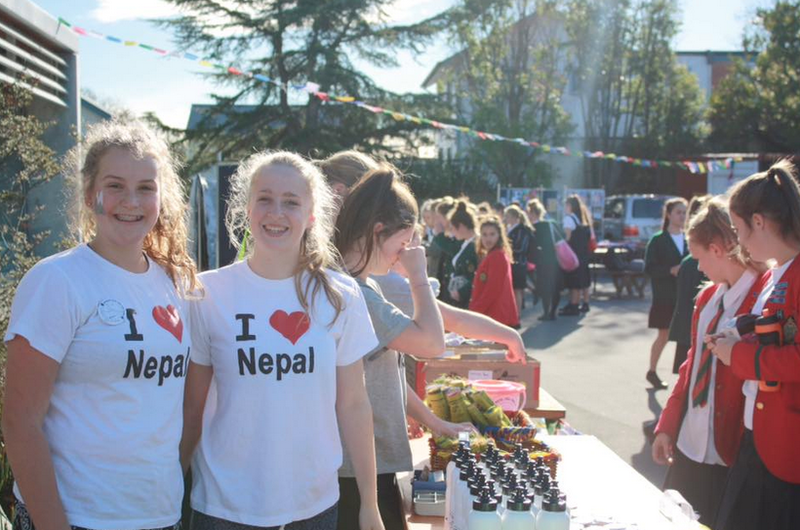 Christchurch schoolgirls who were in Nepal during the devastating April earthquakes have helped raise more than $20,000 for the Nepali recovery effort. Twenty six students and four teachers from St Margaret’s College were in Nepal when the 7.8 earthquake hit on April 25. Nearly two months on, the small Himalayan country is counting the losses from its worst natural disaster in recent history. Almost a third of the country’s public health facilities have been damaged or destroyed in the aftermath of the quake. Hundreds of people have attended the St Margaret’s fair which raised funds and collected 120 tarpaulins to be shipped off in a fortnight before the monsoon season arrives. St Margaret’s College, in conjunction with the Farmy Army, were supported by Mitre 10 stores, the Nepal Friendship Society, Crimewatch and the Himalayan Trust. Organiser Helen Heddell says receipts totalled more than $20,000 with many donations going toward the international freight costs. Christchurch’s Sam Johnson is in Nepal helping build shelters in outlying areas of Nepal that have had no assistance since the devastating earthquakes. Johnson, who foundered and led the Student Volunteer Army after the Christchurch earthquakes, has joined forces with the RiseNepal organisation to build temporary homes in the village of Chaimale, about three hours from Kathmandu. His mission has the support of Air New Zealand and other benefactors. For any further information contact Helen Heddell, Farmy Army, on 0274 361389 or Kip Brook, Media Consultant, at Make Lemonade on 0275 030188.